Sometimes, in my rush to get to the next thing, I miss what is right in front of me, the now. When my path crosses with that of an individual who has gusto for the beauty all around us, I feel more alive and grateful. These individuals are the “awakeners,” the people who knock me out of my numb sleepwalk and activate my senses to see and experience life. They help pull my thoughts away from how the past could have been or what the future might be. They help me to pause, breathe, and see. I tend to find these awakeners when I stumble off the beaten path. I have written about a few individuals like this recently: the 77-year-old Kawasaki racer, Don Barnowski and his vision on life, and my own father, Thomas J. Brennan. One of the most inspirational things to me is a dedicated craftsman working at one with nature. This could be in art, food, music, and the like. I happen to love a certain place where there are unlimited opportunities for artisans and nature to come together: a little nook in northern Michigan, the Leelanau Peninsula, which jets out into the deep blue waters of Lake Michigan. This rolling landscape is on the path to nowhere, so you have to work to get there. Yet the many gifts that God brought to this world are in abundance there: sand dunes of unimaginable size next to the planet’s greatest source of fresh water, rolling hills filled with fruits that nourish the body, and sunsets that look like paintings, with their purple, pink, and swashes of red. 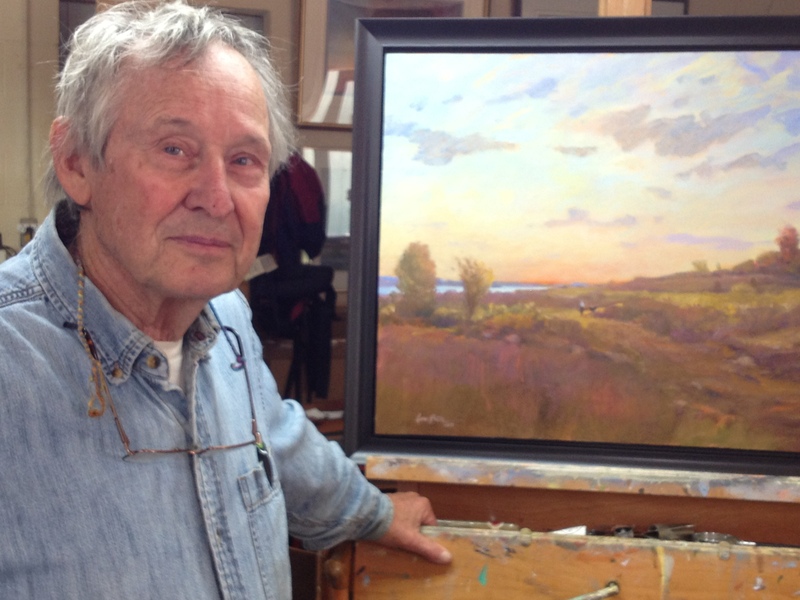 Gene Rantz is one of the artists of the Leelanau Peninsula, and someone I’d describe as an awakener. Gene is a painter, period. Well, actually he is a bit of a renaissance man, but more on that later. I had admired Gene’s painting for nearly 15 years, but never had the chance to meet him. My wife had recently passed Gene’s old gallery at his house and saw that it was closed, but I’d been told I might find him at his studio north of the town of Northport, a quiet community and one of the prettiest corners of the earth. The directions to Gene’s studio went something like this: “Take the road north of town. When you see some big boulders on the right-hand side, turn in the road right between them.” I pulled up between these boulders and found a few tan pole barns stationed between the white pines. 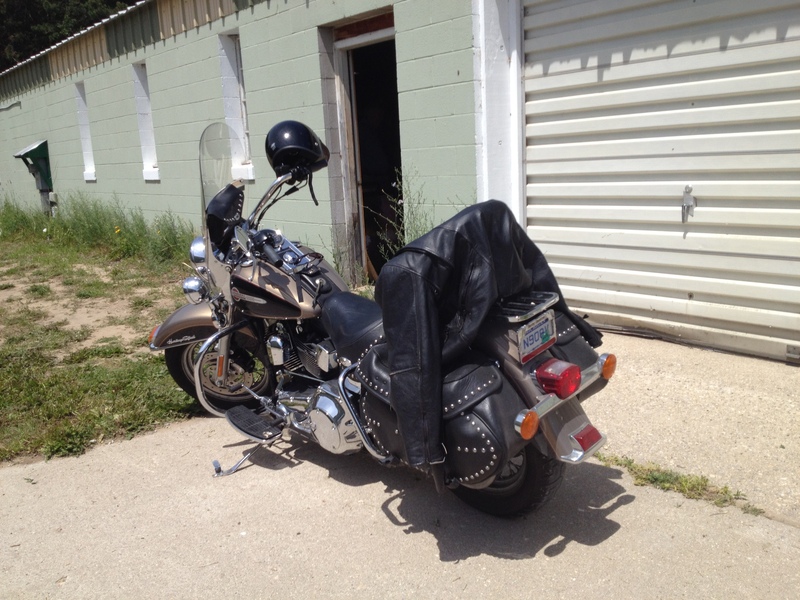 Tucked between two of the buildings was Gene’s motorcycle, a big and heavy Harley Davidson with black leather bags dotted with silver rivets and his leather coat draped across the back with his helmet resting on the gas throttle. Being one who likes to climb upon a cycle as well, I thought, I am going to like this guy. When I walked into Gene’s simple but warm studio, I saw a man with keen green-blue eyes that seemed to have a gentle but knowing ease about them. He was eager to say hi, but more importantly, he was eager to talk about what he was learning. “I am just beginning to understand colors. 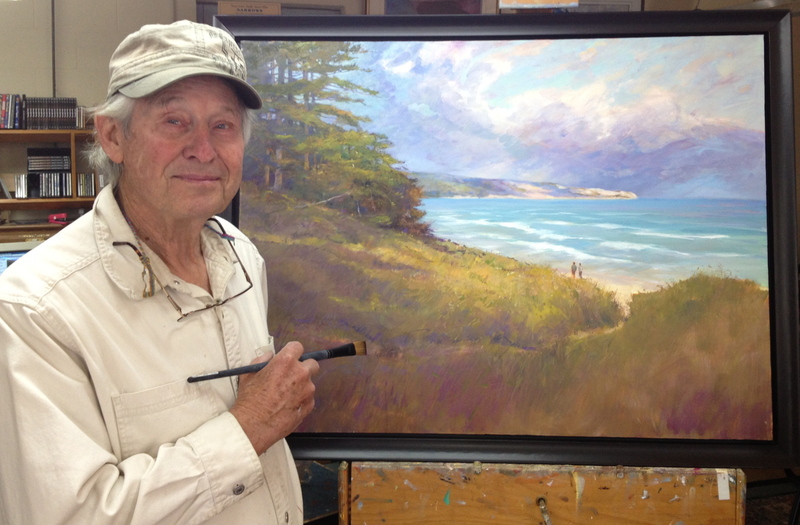 I find I need color more in my paintings as I get older,” Gene said. “How old are you, Gene?” I asked for some reason. “I am the ripe old age of 80,” he said. “Nice bike out there,” I commented. “Yeah, I like it. I started taking up riding a motorcycle when I was 70. I have two now, a Harley and a Yamaha,” Gene said. 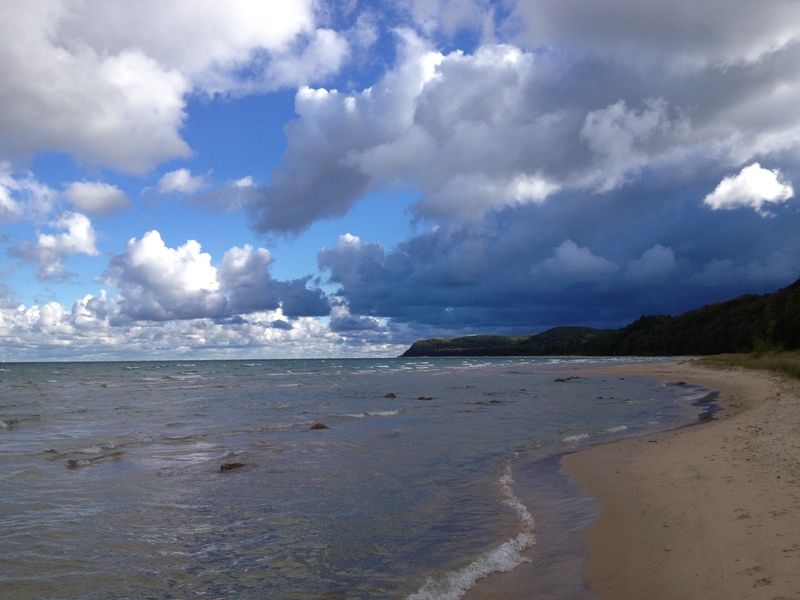 “How did you ever get to be a painter up here in northern Michigan?” I asked. “I was working in Kalamazoo as a graphic artist. When I turned 50, I decided to pack it all in, take my sailboat, and head north. I landed in Northport, met Judy—my wife—at the local bakery. I decided then that I wanted to paint for the rest of my life, which I have been doing now for the past 30 years,” Gene reflected. “I am an impetuous painter. I want to paint only good paintings. What good is it if there is just a bunch of lousy paintings? I have now decided to take a year [to finish] if that is what the painting requires,” Gene said with purpose. Gene showed me the paintings he had been working on and a few from the past. He lifted up a small one that he had just completed of one of the most precious spots on this planet: Sleeping Bear Bay with the dunes set in the background. That particular painting stuck in my mind and I later asked Gene if he would make a similar painting for my wife and me. He agreed and about 5 months later Gene called to say it was finished. “I like how it turned out. Everyone that sees it seems to think the same,” he said in a voicemail. I walked into his studio to pick it up, carrying a bottle of bubbly from a nearby winery to celebrate. I asked Gene, “Do you indulge a little?” He nodded in affirmation, understanding that you have to take time to celebrate the little, as well as the big, moments in life. “They do something like this when they launch ships. Seemed to me we ought to do it for this painting,” I said. I often hear people share the downside of their lives, often because they have true burdens. Yet, when you hear Gene talking about the other side of the coin, you can’t help but think about your own worldview. We sat down in his studio, which he freshly had cleaned up, yet it still reflected an artist in motion. There was the main easel that held whatever painting he was working on, along with old wooden tables scattered throughout and bookshelves loaded with collections on art, colors, and history. Twenty to 30 of his paintings from throughout the years lined the walls and floor and leaned against anything vertical. The sounds of the Jackie Gleason Band filled the room with a pleasant ease and sense of joy. Gene is beginning to give up other hobbies in his life, selling his boats and motorcycles to dedicate all his time to painting. “I have this pent up love for the beauty of nature I see in the world that I just need to get out,” he reflected. I left Gene’s studio not only with my painting, but with a reminder that we need to be connected to nature and the things we love, and we must create pathways to release what is “pent up” inside of us. I have been blessed in my life, doing work that I care deeply about and that has always aligned with my deep inner core. But like Gene, I always want to make sure I am stewarding that inner passion in a way that contributes to the world, and I want to keep learning—finding the colors that are present in my passions. Gene’s story has me thinking about and asking myself and others: What is “pent up” inside of you?